Banners.com recently printed some vinyl banners for Anna Lindsey's Sewing Basket. She used the banners at a local craft show. Desiree - thank you so much for getting my banner to me so quickly! I thought you might enjoy the photo I've attached. It's just a quick phone photo that I took at the end of my craft show this afternoon. 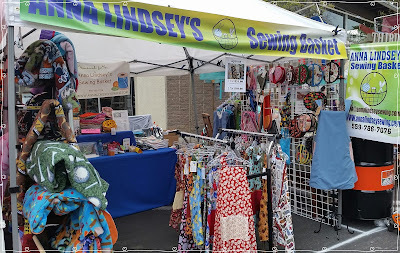 The long one was clipped on the front of my booth as I didn't have time to put it in the sleeve that fits across the front. However, I thought it looked great and was really easy to read! I will definitely come back to Banners.com! Your customer service was OUTSTANDING! 5 stars to you! If you have an upcoming trade show, or craft show and have a booth, head over to Banners.com - we can help you get the right signage to make your booth stand out!